After completing all of the assembly and sanding of your woodworking project, you've painstakingly applied an even stain finish over the entire project and are happy with the evenness of the stain, and how the rich color of the stain shows off the character of the wood grain in the project. Are you done with the project? Not by a long shot. You now need to protect that stained finish with a quality topcoat protectant. To find the answers you're looking for, here are a series of articles that detail some of the most popular topcoat finishes to protect your stained project. Polyurethane is one of the most popular finishes to become available in recent years because it is easy to apply, durable, and generally lets the color of the stained wood show through. There are two types of polyurethane, those being oil-based and water-based formulas, and there are differences in how and when each type should be used. 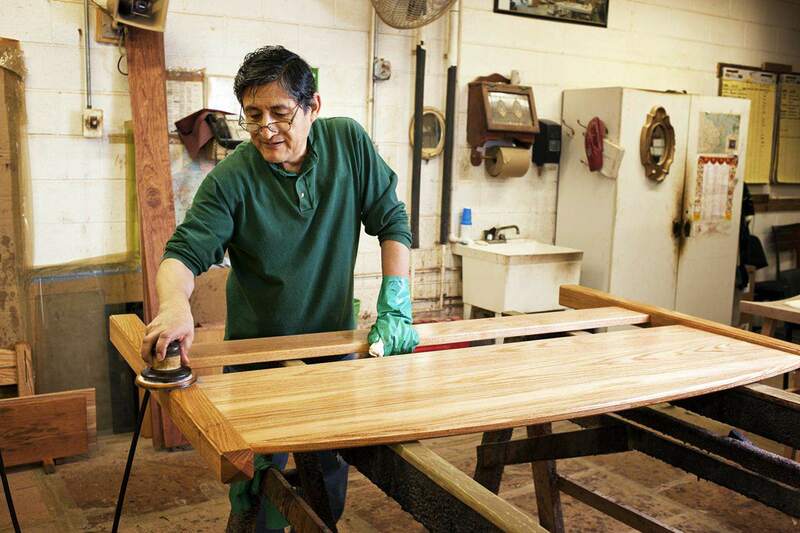 On the downside, polyurethane topcoats are difficult to repair cleanly should the finish be damaged, and the topcoat can tend to yellow over time, which will affect the color of the stain and the look of the project. Clear lacquer finishes are very tough, can take the beating of a well-used project and are relatively water-resistant. Lacquer finishes are also available tinted that work much like paint, and can be brushed or sprayed onto the project. Lacquer is fast-drying, although spraying can be a bit messy. On the downside, most lacquer finishes are susceptible to damage from ultraviolet light, so knowing the limitations will help you to determine whether lacquer is the right choice. Should you decide to apply a lacquer finish, one of the more timely but rewarding exercises is to hand rub the lacquer finish to a mirror shine. There are some specific steps, and because of the work involved, you'll likely want to reserve this for large surfaces like a tabletop rather than intricate pieces with many parts that have a lot of tight edges. There may be no easier topcoat to apply or one that is more forgiving than shellac. This topcoat formula actually comes from a resin secreted by specific insects. While that sounds rather unappetizing, the raw shellac is actually left behind on trees and is scraped off of the bark, processed and then mixed with alcohol before applying. While shellac isn't the toughest or most waterproof of topcoats, it is probably the easiest to repair in the event of damage. Additionally, using the techniques of French polish, you can make a shellac finish have a mirror-like shine. If you want to go a bit old school with your topcoat, consider a paste wax finish. This type of finish has been used for many, many years, with beeswax formulations being replaced by carnauba wax in recent years (although beeswax can certainly still be used). While paste wax can certainly be used as a topcoat in and of itself, it is also often used to give a shine to a lacquer or polyurethane topcoat.